Info "Tip the Form Baton to change the angle of the bar. Help get the people in the building to the rescue crew!" Fired Up is a microgame in WarioWare: Smooth Moves. It appears in Mona's stage. It is a puzzle-themed microgame. The player needs to save people from a burning building. The player controls platforms with the Wii Remote. The player needs to see where the person jumps and needs to tilt it in the correct position to the firefighter's trampoline. In harder levels, there will be two or more platforms, and the player needs to watch carefully which platform the person will jump to. Sometimes the person will have to bounce on two platforms to reach the trampoline. 1st level difficulty: There is only one platform and one person to rescue. 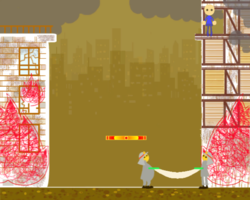 2nd level difficulty: There are two platforms and one person. 3rd level difficulty: There are three platforms and two people. This page was last edited on February 19, 2018, at 16:51.